What Does the Dance of Death Mean? The Dance of Death is an allegory consisting of dialogues between various personages depicting different classes and occupations of medieval and Renaissance European society. 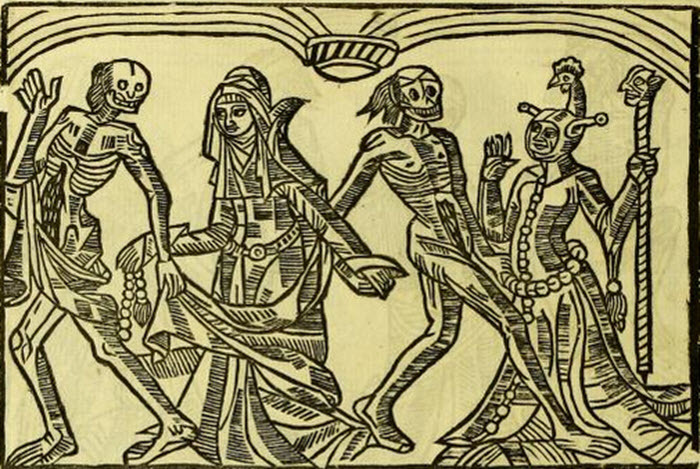 Death is depicted as inviting its reluctant partners to a dance, which they cannot refuse to participate in. 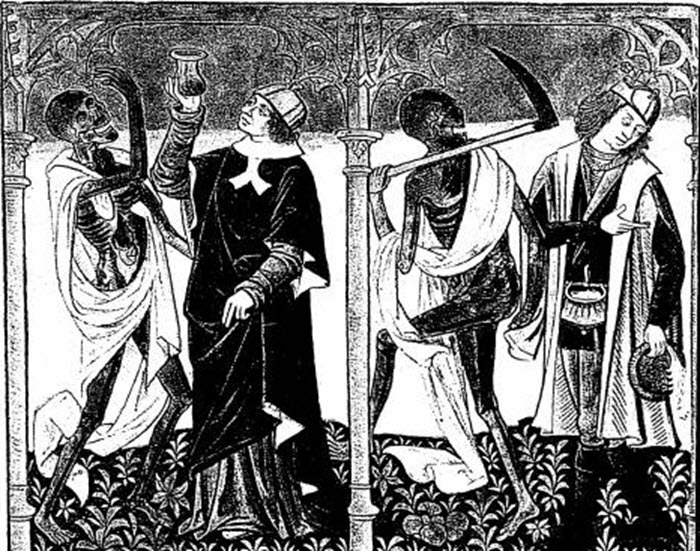 Death's dance partners range from high to low on the social scale, from Bishops to Knights to Kings and Peasants -- all are equal before death. And therein lies the central meaning of this fable: no matter who you are in this life, death will one day ask you to dance, and claim you. This drama was most simply constructed, consisting of short dialogues between Death and twenty-four or more followers, and was undoubtedly enacted in or near churches by religious orders in Germany during the 14th c., and at a rather later period in France. It would appear that the seven brothers, whose martyrdom is recorded in the 7th chapter of the 2d book of Maccabees, either played an important part in the drama, or the first representation, which took place at Paris, in the Cloister aux Innocents, fell upon their festival, and hence the origin of the ancient name, Chorea Machabaeorum, or La Danse Macabre. As early as 1400, the dramatic poem was imitated in Spain, and appears there in 79 strophes of 8 lines each (La Danga General de los Muertos), but it did not spread; while the French, having a love for pictorial representation, very early affixed an illustration to each strophe, and in 1425 painted the whole series on the church-yard wall of the Cloister of the Innocents, where the Dance of Death was habitually enacted. We find the subject treated in painting, sculpture, and tapestry, in the churches of Anjou, Amiens, Angers, Rouen, to say nothing of the numerous wood-cuts and accompanying letter-press which succeeded the invention of printing. From Paris, both poem and pictures were transplanted to London (1430), Salisbury (about 1460), Wortley hall in Gloucestershire, Hexham, etc. But nowhere was the subject so variously and strikingly treated as in Germany. A picture in one of the chapels of the Marienkirche, at Lubeck, still, in spite of repeated repaintings, bearing the unmistakable impress of the 14th c., exhibits the very simplest form of the drama, and has some genuine Low German verses attached to it. Here we see 24 figures, partly clerical, partly lay, arranged in a descending scale, from the pope himself down to a little child, and between each of them a dancing-figure of Death, not in the form of a skeleton, but a shriveled corpse, the whole being linked in one chain, and dancing to the music of another Death. This representation is almost the same as a very ancient one at La Chaise-Dieu, in Auvergne, and points to the identity of the original dramatic spectacle in both countries. The celebrated Dance of Death on the cloister walls of the Klingenthal, a convent in Basel, though painted probably not later than 1312, exhibited a departure from the simplest form: the number of persons exceeding the original 24, and the chain being broken up into separate couples. But both alike are only to be regarded as scenes from a drama, and cannot, therefore, be justly compared with a contemporary Italian painting, the Triumph of Death, by Andrea Orcagna. And the acted drama enduring till the 15th c., we find that while there were varieties in the paintings, the poem, which was the most important feature, remained unchanged. About the middle of the 15th century; however, the drama being altogether laid aside, the pictures became the main point of interest, the verses merely subsidiary. Accordingly, we find from this time the same pictures repeated in different places, with different verses, or no verses at all, till at length both verses and pictures entirely change their original character. The Dance of Death being transferred from the quiet convent walls into public places, gave a new impulse to popular art. Duke George of Saxony had, in 1584, the front of his Dresden castle ornamented with a life-size bas-relief of the subject, and other representations are to be found at Strasburg and Bern. 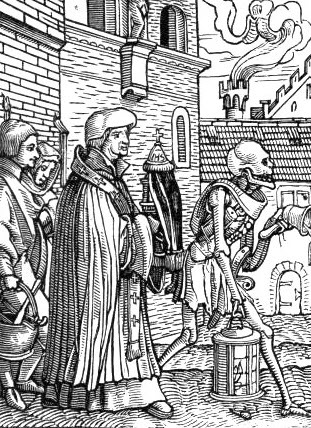 There was a Dance of Death painted round the cloister of old St. Paul's in London, in the reign of Henry VI. ; and there is a sculptured one at Rouen, in the cemetery of St. Maclou. But Holbein has the credit of availing himself most effectively of the original design, and giving it a new and more artistic character. Departing from the idea of a dance, he illustrated the subject by 53 distinct sketches for engravings, which he called Imagines Mortis. The originals of these are at St. Petersburg, and impressions of them have been frequently repeated under different names. We may cite as authorities on this subject, Peignot's Recherches mr les Dames des Marts (Dijon and Paris, 1826); Massman's Baseler Todtentdnze (Stuttgart, 1847); and Douce's The Dance of Death (Lond. 1833). Dance the Dance of Death!